On the way from Switzerland to Berlin in early in September 1907, Gabriele Münter and Wassily Kandinsky briefly visited the family of her brother, Carl «Charlie» Theodor Münter, in Bonn. 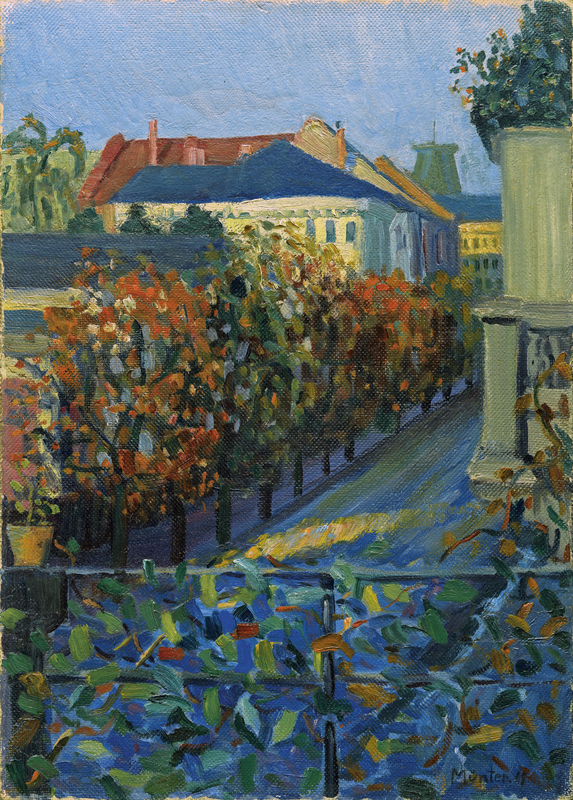 While there, Münter sketched the view from the balcony of the house out onto the tree-lined street before it, then employed her sketches as basis for this painting, completed in Berlin early in 1908. Apparently she gave the painting to her brother and never exhibited it. As it recorded the memory of days spent in his home, the painting was a testimonial to the bonds uniting sister and brother, a private more than a public statement and image. Münter painted few works during 1908 before she and Kandinsky went to Murnau in August. Thus View from her Brother's House in Bonn offers rare testimony to the transformation her work underwent then. It retains the modified late Impressionist approach she had employed since 1903. The trees lining the street are represented with small dabbed touches of paint, the brush frequently dipped into several colours simultaneously so that each stroke is richly nuanced and varied. Next to such stippled areas, however, the street and the walls of buildings are rendered in long strokes systematically parallel to one another to define vertical or diagonally receding surfaces. Each object within the painting appears to demand its own manner of rendering, offering a disjunctive compositional construction that nonetheless retains a clear sense of cohesive unity. Most emphatic in the image are the railing and intertwined vine in the bottom third of the painting. The white and gold building facades, linked to the grey fragment of the balcony of the Münter house at the right, however also offer a planar frame, a containing repoussoir, for the street, its row of trees and their sense of spatial depth. In this manner, Münter produced a tightly controlled composition with a subtle interplay of its diverse components. Münter's colours here interact with the compositional structure in an unconventional manner. Deep tonalities of varied blues and greens, interspersed by bright touches of red and golden brown, dominate the entire lower section of railing and street, counteracting their perceptional quality of depth by defining the foreground. Golden reds, dark greens and tones of orange, surprisingly autumnal colours in this painting depicting late summer, mark the line of trees in the picture centre. And behind them emerge bright white and yellow buildings, their sunlit walls and rows of dark blue windows visually pushing forward while the pale flat blue of the sky echoes the horizontal band of the vine-covered railing at the bottom of the scene. The sophistication of Münter's compositional arrangement and colour treatment significantly surpasses the quality of her prior works. While aspects of her new approach in Berlin recall the paintings by Vuillard that she admired in Paris, the depiction of the Bonn street scene derives its enhanced use of composition and colour more directly from Münter's own prints, the colour linocuts to which she devoted much of her energies during 1907 and early 1908. In them she defined the simple yet subtle orchestration of masses, colours and spaces that she now applied in this painting as a seminal move towards her mature Expressionist manner of painting. With the even more radical reduction of elements and employment of a-naturalistic tonal contrasts, as well as greater disjuncture in the compositional units, that characterize her Expressionism, in 1911 during another visit to her brother's home, Münter depicted the scene from the window in a second painting, as if to reaffirm for herself the pivotal role the 1907 painting had in her development.